We're having a rainy Monday here in Chantilly, with no sign of sunshine in the forecast! :( But here's something to look forward to: Our Spring Sale officially starts on Thursday! We're going to have a sidewalk sale where we'll be bringing out some boxed items from the warehouse with special pricing, in addition to our Red Tag specials on display. And then all of our regularly priced stock items will be 15% off (excluding fans). It's going to be great! This is from Kichler's French Quarter family. 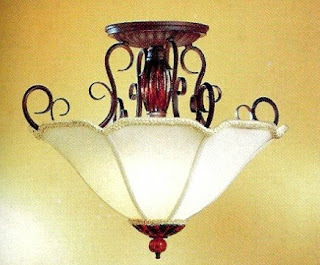 It features a tan linen fabric shade with braided gimp trim & tortoise glass accents, it's 17" wide by 13-1/2" high, and takes two 100-watt bulbs. The original price was $144, but we have it on sale for $75.